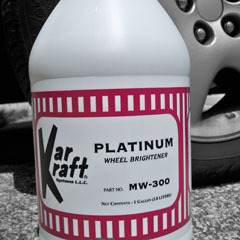 An exceptional cleaner for coated wheels. Platinum is equally effective on chrome-plated steel/wire wheels and alloy wheels. Truly one wheel cleaner for all applications. Safe for use on coated OE wheels. Test on aftermarket wheels before using. Not for use on uncoated aluminum wheels.